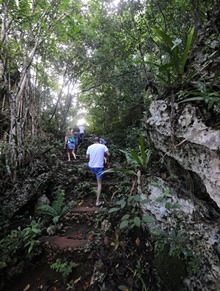 The caves of Cabarete on the north shore of Dominican Republic, just outside of the town of Cabarete, are part of El Choco National Park. On the west side of Cabarete town, turn left at Callejon de la Loma and follow this street to the end. This street is full of local color with its many businesses ranging from restaurants, meat markets, small grocery stores and beauty salons. You can drive or walk or hire a moto concho to get there. If walking from the main street you can expect to walk for about 20 minutes to the end where you will pass by the lagoon on the left side of the road. 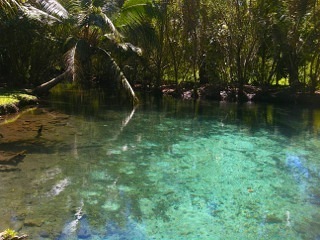 This is a good spot for a photo opportunity, with crystal clear turquoise waters lined with palm trees. Soon afterward you will come to the small park ranger shed. 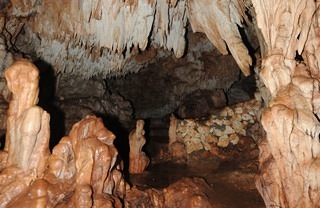 Guided tours are offered to the many clear pools and caves.